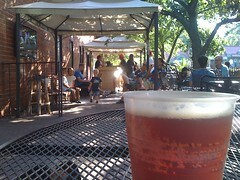 Have a beer and bourbon festival at a place you have to drive to. 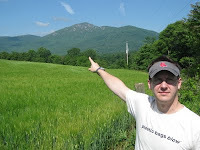 The Green Miles hadn't hiked Virginia's Old Rag Mountain since my first trip there back in 2008. Back then, my friend Dan & I took the relatively easy back route to the summit to reach the 3,291-foot peak's spectacular views. This month, we took the front way up - much steeper and with a series of challenging rock scrambles. I'm not sure we'd have made it up if not for the church & scout groups that were hiking up around the same time - each had an experienced hiker with the group who explained the best way to tackle tough stretches & gave helping hands when needed. If you're looking to reward yourself on the way home, stop by Pearmund Cellars in Broad Run. After a weekend in Massachusetts visiting family, The Green Miles is riding the Amtrak Northeast Corridor Regional train from Providence to DC today. It's about twice as long as flying and just as expensive, but I like the relaxing ride, the ability to get up & walk around, and the view of the shore as the train hugs the Atlantic coast. And of course the usual assortment of crows, Canada geese, sea gulls, etc. This new ad for the Nissan Leaf turns the conventional wisdom surrounding electric cars on its head. Is it really such a revolutionary idea to run our cars on electricity when we rely on so many gadgets we wouldn't power with anything else? Buzzkill: Does Climate Crisis Mean We've Hit "Peak Coffee"? But in the last few years, coffee yields have plummeted here and in many of Latin America’s other premier coffee regions as a result of rising temperatures and more intense and unpredictable rains, phenomena that many scientists link partly to global warming. Coffee plants require the right mix of temperature, rainfall and spells of dryness for beans to ripen properly and maintain their taste. Coffee pests thrive in the warmer, wetter weather. Bean production at the Garzóns’ farm is therefore down 70 percent from five years ago, leaving the family little money for clothing for toddlers and “thinking twice” about sending older children to college, said Mr. Garzon’s 44-year-old son, Albeiro, interviewed in a yellow stucco house decorated with coffee posters and madonnas. “Coffee production is under threat from global warming, and the outlook for Arabica in particular is not good,” said Peter Baker, a coffee specialist with CABI, a research group in Britain that focuses on agriculture and the environment, noting that climate changes, including heavy rains and droughts, have harmed crops across many parts of Central and South America. And it hasn't gotten any better since this New York Times piece was written in March - last month, torrential rains triggered landslides in Brazil. Famed science deniers Willie Soon and Paul Driessen, both of whom have worked for groups that accept cash from Exxon Mobil to pretend global warming isn't happening, have a new crusade: Mercury denial! That's right: They have an op-ed in Wednesday's Wall Street Journal claiming that breathing toxic mercury isn't bad for you. Willie Soon, astronomer. And Paul Driessen, lobbyist with a degree in geology. Expertise in public health? Limited. Willingness to take cash from the coal polluters that pump tons of mercury into our air every year? Extensive. For fetuses, infants, and children, the primary health effect of methylmercury is impaired neurological development. Methylmercury exposure in the womb, which can result from a mother's consumption of fish and shellfish that contain methylmercury, can adversely affect a baby's growing brain and nervous system. Impacts on cognitive thinking, memory, attention, language, and fine motor and visual spatial skills have been seen in children exposed to methylmercury in the womb. Recent human biological monitoring by the Centers for Disease Control and Prevention in 1999 and 2000 shows that most people have blood mercury levels below a level associated with possible health effects. More recent data from the CDC support this general finding. In addition to the subtle impairments noted above, symptoms of methylmercury poisoning may include; impairment of the peripheral vision; disturbances in sensations ("pins and needles" feelings, usually in the hands, feet, and around the mouth); lack of coordination of movements; impairment of speech, hearing, walking; and muscle weakness. The Environmental Protection Agency is acting right now to limit mercury pollution. Please take a moment to tell the EPA you support its efforts. A hundred years ago, humans hunting for food had nearly wiped out local populations of deer, turkey and even squirrels in the Mid-Atlantic region. And humans protecting their livestock or hunting for trophies wiped out bear and wolf populations. Deer were eventually reintroduced - and their populations exploded. While black bears have made a comeback, they're too slow to hunt adult deer. Wolves are great deer hunters, but reintroduction efforts in the eastern half of the United States have had limited success. And deer hunting is restricted on private property & on federal parkland, where deer thrive dashing through backyards and parks. As an ever-rising population of white-tailed deer have bumped up against their human neighbors in the D.C. area, the results haven't been pretty. 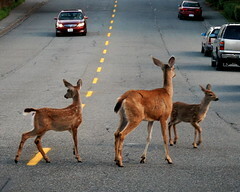 There were an estimated 88,000 deer-vehicle collisions in Virginia, Maryland, D.C., and Delaware last year. But beyond the roads, experts say the deer are also having a major impact on forests, which are unable to replenish themselves to nurture the next generation due to the deer population's eating habits. Nationwide, those deer collisions result in 140 deaths and $3.8 billion in property damage every year. And it's not as if overpopulation is great for the deer, which can face starvation and disease. This isn't a problem only in rural areas - Rock Creek Park is being stripped of plants below shoulder height. Even if deer populations came into balance today, it could take generations for trees to recover. But the good news is that proper population management can deliver results right away. In Yellowstone National Park, a combination of hunting and wolf reintroduction have helped drive a rebirth - not just for trees, but for the birds, beaver, and dozens of other species that depend on a balanced ecosystem. The bottom line is that unlimited, unchecked deer population growth isn't good for anyone - not for deer, not for humans, and not for our ecosystems. Update: My friend Max points out, "And how about deer ticks? Since I work in Reston, I walk through approximately eleven billion deer ticks every day between the bus and the front door of my office." Update #2: WAMU has corrected its number for vehicle-deer collisions & this post has been updated to reflect that. Why didn't anyone give it a minute to calm down & offer it some food? A group of well-meaning citizens then came up empty handed when the goat wandered into a courtyard of a nearby apartment complex. That's good thinking, Hard-Breathing Man! Now that the Westover Market Beer Garden's conditional live music permit has been approved, up next on the Arlington County Board's agenda of unsolvable issues: At what temperature should we set the thermostat? The task force recommended a goal of reducing greenhouse gas emissions from today’s 13.4 metric tons carbon dioxide equivalent per capita per year to 3.0 metric tons per capita per year by 2050. If a regional energy plan is put in place, the task force advocates achieving 2.2 metric tons per capita per year. That's what everyone should be talking about today. Arlington County will cut its carbon pollution, jobs in energy efficiency will be created, and Arlington residents will save boatloads of money on their energy bills. But when you do stuff that's really ridiculous & silly at the same time you do stuff that's really good & important, people tend to focus on the ridiculous. Like, say, trying to ban kids from dancing. No, really - the Westover Market Beer Garden live music permit includes this: "Patrons and performers will be prohibited from dancing, unless the Market applies for and obtains a Dance Hall Permit." The Footloose jokes are already flying fast & furious over on Facebook. 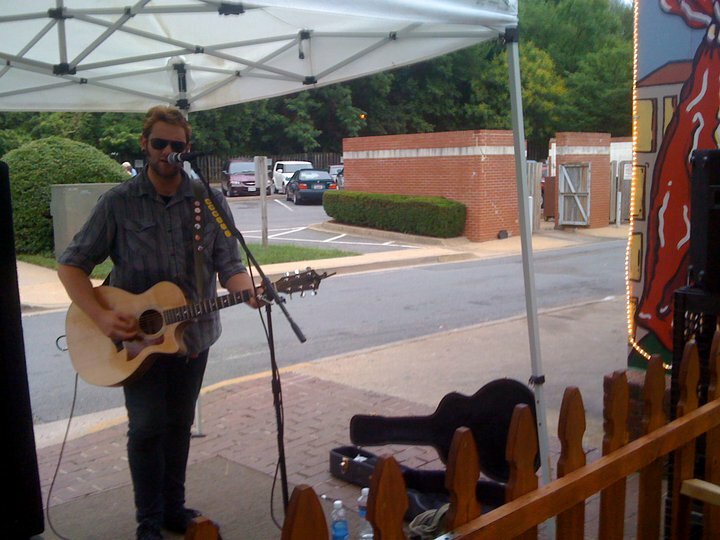 During the more than two hours of discussion on Saturday by the Arlington County Board over a live music permit for the Westover Market Beer Garden, there was a brief moment of clarity. County Board Member Chris Zimmerman pointed out that the Arlington County code on noise control (PDF) doesn't just provide decibel limits. It also prohibits any noise that "Annoys or disturbs a normal person of reasonable sensitivities." Zimmerman shook his head and said, "How is county staff supposed to enforce THAT?" 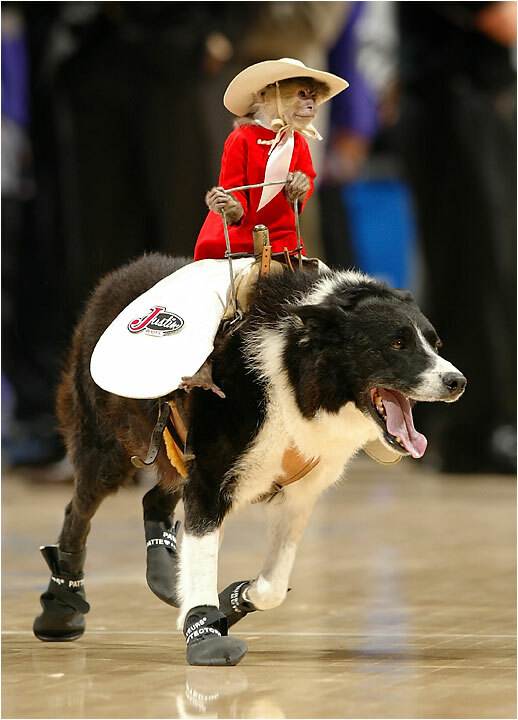 The hearing displayed the constraints of using the law to limit things that are impossible to measure. Much like trying to determine the height at which neighbors will cease to be annoyed by windmills or the number of stories at which a building fits a neighborhood's character, trying to write a law that will prevent everyone from being annoyed by all forms of noise in an urban area is a quixotic effort. But that's not stopping the Arlington County Board from trying! At Saturday's meeting, the Board neither accepted the county staff's recommendation to deny the live music permit nor accepted the compromise plan endorsed by all four local civic associations and supported by a vast majority of local residents. Instead, at today's meeting the Board will apparently continue twisting itself into knots in attempts to placate the literal handful of neighbors still opposed to the compromise. Barbara Favola complained the board could not better regulate the noise from a crowd that was singing along or clapping to the music. Walter Tejada lamented the board could not legislate the effect of wind on noise. And a recurring theme was that board members wished they could regulate people talking loudly as they walked home - as if that wasn't simply a part of living in an urban area, but a nuisance that could be legislated away. The craziness might've peaked when an anti-live music neighbor claimed he could hear the music in his living room with the windows closed over his television ... 1/5th of a mile away. Keep in mind 65 decibels (the level proposed in the compromise plan) is barely above conversation level. One civic association president who testified in favor of the live music permit at the Beer Garden pointed out that if there was no live music in Westover, there would still be plenty of the same noise we all accept in choosing to live in an urban area - cars, trucks, planes. It would just be much less pleasant. What there would be less of is the unique sense of culture and community that live music offers. "There's just no substitute for live music," a Westover-area violin teacher told the board. And a speaker at Saturday's hearing pointed out that children just don't respond with the same joy to taped music as they do to live music. Look, I'm a firm believer in the ability of the law to protect consumers and safeguard our health. But when you try to use the law to regulate people's happiness, you're going to wind up creating rules that are impossible to enforce and leave no one happy. How Should Metro Balance Its Budget? Make Your Voice Heard This Week. DC's Metro system continues to go without a dedicated source of funding. Not coincidentally, DC's Metro continues to come up short on operating funds. So now the agency faces some unpleasant options: Cut service, hike fares, or go hat in hand to DC, Maryland and Virginia asking for more cash? Widen Sunday headways from 15 minutes to 20 minutes until 9:30 PM and to 25 minutes after 9:30 PM until closing. As Greater Greater Washington has detailed, late-night service is no longer a perk - it's a key part of the system. Metro has shifted from a system mainly serving commuters & tourists to one that serves a mix of riders in all parts of the day. Ridership may be lower at these times, but given how valuable the service is and how infrequently trains already run, these cuts look like trying to squeeze blood from a stone. Q5 - Local jurisdictions absolutely should be asked to provide more funding to continue existing service. Whether you ride Metro or not, we all see its benefits in reduced traffic and lower air pollution. Why shouldn't we all be asked to support it? Q6.1 - Again, of the options in the survey, I'd most support "Asking local jurisdictions to provide an increase in financial support." Q7 - Given that taxpayers currently subsidize parking at many Metro lots through artificially low rates, raising parking fees where lots are currently full every day would be a great way to raise needed funds. All sessions start with an open house at 5:30pm, a town hall at 6pm, and a public hearing at 6:45pm. You can see the full hearing schedule (PDF) and learn how to sign up to speak at WMATA.com/Hearings. You can also submit written statements until 5pm on May 24, 2011 by emailing writtentestimony@wmata.com (note that submissions are considered public records). There's a compromise on live music at the Westover Market Beer Garden that both the Beer Garden owners and the Westover Civic Association support. But will that be enough for the Arlington County Board to give its approval? 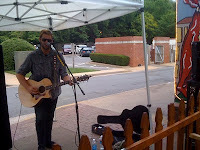 The basic compromise is that the Beer Garden would have live entertainment Fri and Sat nights (6-10) and some Wednesday open-mic nights (6-8), so long as the Market complied with the decibel limits set out by the county noise ordinance. It was decided not to focus on what type of noise is permissible (TVs or no TVs, drums or no drums, acoustic or amplified), but rather the decibel limit. Also it is the responsibility of the Westover Market to ensure that its entertainment comply with those limits or risk losing their permit. The compromise was approved at a Westover Civic Association meeting with an astounding 90 out of 109 votes. Another 13 people supported live music with additional restrictions, and 6 people voted to oppose music under any circumstances. What was most frustrating is that the members of the community debated with each other at length to find a compromise that nearly everyone supports only to learn that the county is more concerned with the precedent than what the neighbors want. Given that Westover Market Beer Garden is bending over backwards to be a good citizen (there's talk of having a decibel meter on hand in the Garden at all times), I can't imagine the County Board rejecting this compromise. Especially given that over the last year Arlington County has been accused of being hostile to everything from businesses to music to fun, this vote will be a key bellwether of whether the County Board is backing up its conciliatory words with progressive deeds. Please email the Arlington County Board right now to let board members know you support live music in the Westover Market Beer Garden. Then if you can, attend Saturday's Arlington County Board meeting and speak at 8:30am during the pre-meeting public comment session. "They Say That Oil And Water Don't Mix. But Dammit If We're Not Trying!" Hey, maybe we just haven't been looking on the bright side of oil disasters. The ocean gains new traits ... like being able to light it on fire! And maybe new species will evolve, like birds that ... uh ... enjoy being sticky! Hey, coal pollution may cause millions of asthma attacks and kill thousands of Americans every year. But that doesn't mean the coal industry doesn't have a heart! Peabody Energy is now offering free asthma inhalers for kids. Get yours at CoalCares.org. I went for a trail walk with my friend Every Day Father and his two children last weekend, check out the story of the secret dinosaur trail over at the National Wildlife Federation blog. The Green Miles is always late. Always. You could give me two hours' notice to get to a place that's a 10 minute walk away, and I'd still leave home late & come stumbling in a few minutes past due. When I ran for House of Delegates, I'd make sure to plan on being at events at least 15 minutes in advance (the community centers usually appreciated the help setting up the folding chairs anyway). So with all that being said, I'm sure you'll be shocked to hear that I went stumbling out the door to Wednesday's Arlington County Democratic Committee meeting 20 minutes late. I'd originally planned on walking from my apartment building in East Falls Church at Roosevelt & Wilson down to the meeting in Ballston, but that would take about 45 minutes. I thought about walking down to EFC Metro, but that wouldn't be much faster. Then I realized there are Metrobuses that run down Wilson to Ballston that I'd never taken before. 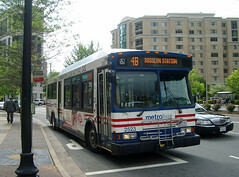 I walked to a stop to get its ID number, then used my Blackberry's internet browser to get to Metro's Next Bus service. Sure enough, there was a bus coming in less than 10 minutes. The ride was smooth and I didn't just make it to the meeting on time - I was a couple of minutes early. Really weird feeling for someone who's chronically tardy. Growing up in Boston, I always had to deal with buses that were loud and smelled like exhaust and had no shocks and you never knew when they were coming. Plus, my first experience with Metrobus didn't exactly endear me to it. But the pleasant ride and Next Bus feature made the trip a lot smoother. Maybe I'll give the bus another shot as the evenings get nicer and I'm looking for a way to get from Upton Hill Regional Park to Clarendon without a car. For someone so anxious to drill for oil just miles from Virginia Beach, Bob McDonnell is awfully terrified to say the word "drill." In his op-ed today in the Richmond Times-Dispatch, Gov. McDonnell never uses the words "drill" or "drilling" - not even once. And with good reason! 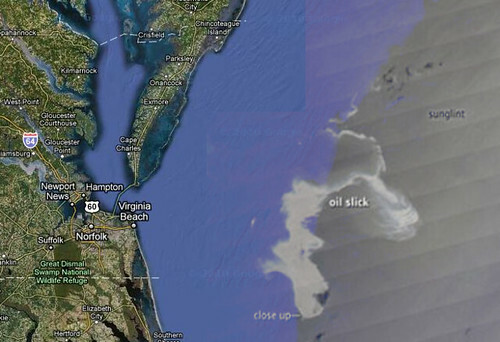 You might remember the image at right, produced in the very early days of the Deepwater Horizon disaster to show what the slick - just a fraction of the size it would eventually become - would look like if it happened off the Virginia coast. As much as Gov. McDonnell would like us to forget about those thousands of dead birds, hundreds of dead endangered sea turtles, and more than a hundred dead dolphins, he's wrong dismiss the Gulf oil disaster as an "accident." The Gulf oil disaster was no random twist of fate - the bipartisan commission that investigated the blowout said it was the result of a series of bad decisions by the people doing the oil drilling, called the disaster "avoidable," and warned that without significant reform (which we're still waiting on), it could happen again. But even if oil drilling was less dangerous than it is, would drilling off Virginia do us any good? The U.S. consumes 22% of the world's oil but holds only 1.5% of global oil resources. During the Obama administration, U.S. oil production is up sharply - but that hasn't done a thing to stop gas prices from rising sharply as well. 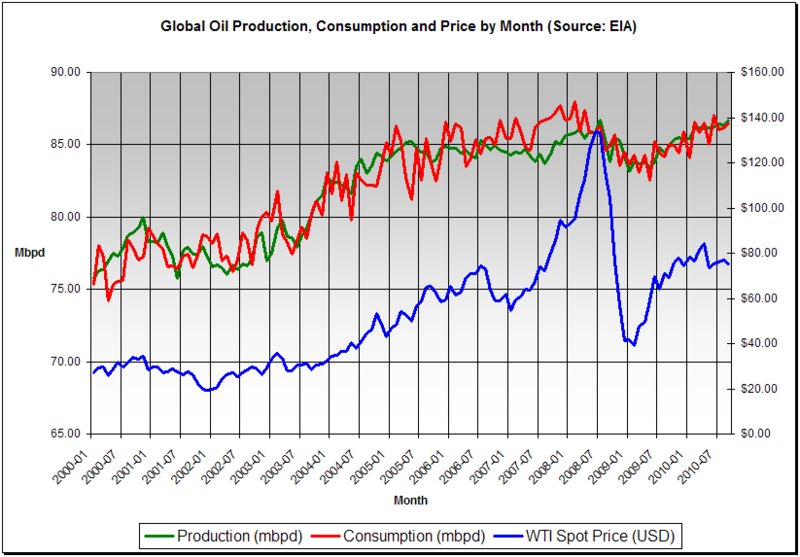 The same story is true on a global scale - worldwide oil production is up, but oil prices are up too. Worldwide consumption is up and the dwindling supplies of oil left underground are getting more & more expensive to drill. We can't drill our way out of our energy problems. The only way we can reduce our oil costs over the long term is to use less oil - fuel-efficient cars in the short-term, renewable energy-powered electric cars in the long term, and building more transit options & more walkable communities over the really long haul so our lives aren't tethered to the gas pump. But hey, Bob McDonnell didn't get $33,150 from Exxon Mobil by pushing for hybrid school buses! He got it by promising to open up Virginia's coastline to drilling & leaving it to some future governor to worry about apologizing for how no one could possibly have predicted an oil disaster here. Arlington County Board Member Barbara Favola kicked off her campaign for Virginia State Senate with a series of embarrassing gaffes - hiring a campaign consultant only to see her reportedly quit soon after, falling victim to a fake Twitter account, announcing the wrong date for her campaign kickoff, and letting her Facebook account get phished. Not the kind of stuff that makes you think she's a bad person or lousy candidate - but does make you wonder if she's running a tight ship. Favola is giving the appearance that she isn't worried about dotting "i"s and crossing "t"s because she thinks she's guaranteed to coast to victory in the primary thanks to her support from the Virginia State Senate Democratic establishment. Following in the footsteps of DC's successful bag fee, the Montgomery County Council has passed a 5 cent fee on disposable bags. The fee applies to both paper and plastic bags at nearly all retail establishments. 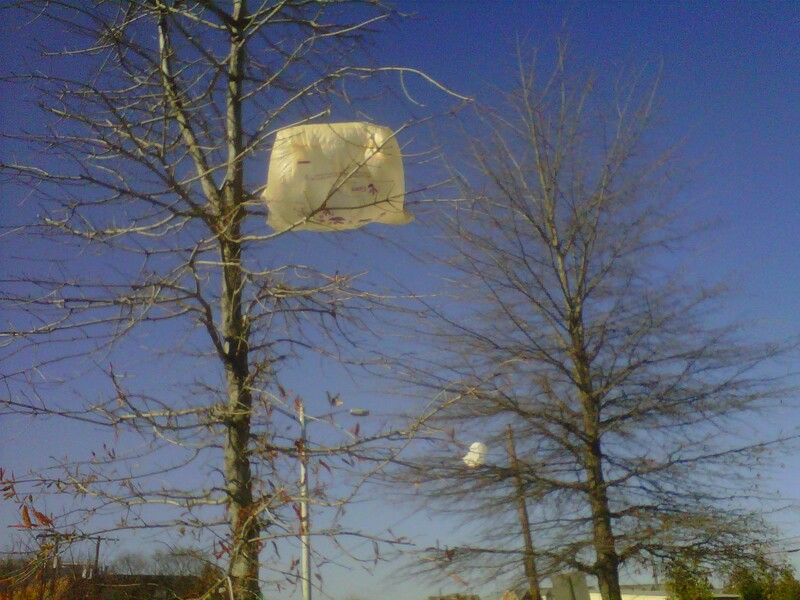 The Virginia General Assembly has not only refused to pass a disposable bag fee, it's refused to even let communities like Arlington impose their own. So we don't get the funding to clean up waterways and we don't give consumers a nudge to change their habits - a lose-lose. Rep. Jim Moran (D-VA) has also introduced a national bag fee with proceeds going to fund conservation programs, but House Republicans seem way too busy trying to protect Big Oil subsidies to act on a bag fee. 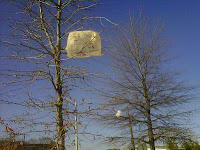 Learn more about why a bag fee makes economic & environmental sense at TrashFreeVirginia.org. It's not something you'd expect to hear from a government run by people who claim to be fiscal conservatives: Virginia is threatening to pull out of oyster restoration work because federal officials won't give free handouts to Virginia businesses. The Virginia Marine Resources Commission is objecting to federal rules that say oyster reefs restored with federal money can't be commercially harvested. It's also balking at the $500,000 contribution to receive $2 million in federal oyster reef restoration money. But those federal rules exist to protect taxpayers. After all, why should public tax dollars be used to subsidize an oyster reef, only to have those oysters turned over to private watermen as a political favor? If Virginia officials want to enrich private businesses with public dollars, why not just save the time & effort and hand tax dollars directly to the watermen? Oh, right - because that would make Gov. Bob McDonnell look like a tax-and-spend socialist. Much better to demand the feds do it for him! Of course, there are plenty of benefits of healthy oysters besides their commercial value. They'll make new oysters, provide food for other tasty things like crabs, and filter Chesapeake Bay water that's in desperate need of cleaning. So why not chip in the 25% to get a federal windfall? Lacking cash, the state has been using the value of old oyster shells as its matching share; shells are the building blocks of new reefs. But the state is running out of oyster shells and already is being forced to mine ancient shells buried within river beds to keep pace with construction needs. You see, ever since they cut a deal in 2004 with then-governor Mark Warner to raise taxes to fund things like roads & schools and Warner got the credit, Virginia Republicans refuse to raise taxes for any reason ever. Then, thanks in large part to George W. Bush's economic policies, the economy crashed, dramatically reducing tax revenue. Combine the two and, well, Virginia's now literally scraping the bottom of the river. Forced to pay our bills with oyster shells - and now demanding a free ride because we've run out of even those. Is this any way to run a state? Why won't Gov. McDonnell put aside politics and figure out how to sensibly raise the cash we need to pay our bills? For years, I've driven past the Meadowlands on the New Jersey Turnpike wondering about the absolutely humongous building next door. First it was under construction ... then it seemed finished ... and since then it's just sat there completely unmarked (unless you count the multi-colored aluminum siding, which, in the immortal words of Wayne Campbell, looks like a plate of hurl). I'd asked friends in New York City about it and they'd had no idea what it was. 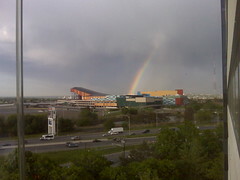 Finally today I learned the answer at Andrew Sullivan's blog - it's a massive, unfinished shopping mall, formerly known as Xanadu, currently known as American Dream Meadowlands. In this era of new urbanism, walkability, and online shopping, what better idea than a multi-billion dollar shopping mall in the middle of nowhere that you literally can't walk to with terrible traffic that makes you wish you'd just gone to Amazon.com? Atlantic Wind Connection: Energy Playing Field Tilting Towards Windmills? 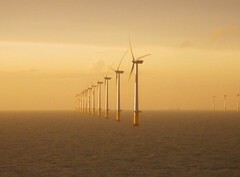 It would tie together wind farms distributed over hundreds of miles of coastline, and because the wind will usually be blowing somewhere, its breadth would compensate for the unpredictability of wind at any individual site. Together, the steadier flow of power, combined with the money that wind-farm developers will save by feeding electricity into an existing network, could make wind power cheaper than electricity generated by natural gas or, in some cases, even coal. Obviously, there is a long way to go. Multiple regulatory authorities will have to sign off before the AWC becomes reality. But the large-scale, holistic approach to offshore wind power that it represents is already echoed by at least two undersea power-transmission proposals being considered in Europe. And if the AWC succeeds in delivering predictable, low-cost, low-carbon power to the mid-Atlantic, expect the number of imitative projects to grow. Every night as I fall asleep, I turn on the old analog TV in my bedroom to SportsCenter and set the sleep timer to 30 minutes. Usually I don't make it 30 seconds before the dulcet tones of Neil Everett have me out cold. But tonight before I could set the timer I noticed the "BREAKING NEWS" icon on the ESPN Bottom Line news ticker. Some major hockey injury news? I wondered. I didn't have my glasses on so I had to sit up and lean in close to see the tiny letters: "President Obama announces U.S. Special Forces have killed Osama bin Laden." I haven't literally leaped out of bed like that since I was a little kid waking up on Christmas morning. Killing bin Laden can't bring back any of the innocent victims of the September 11th attacks. But I do hope justice finally being done provides some comfort to their families. From the crowds in front of the White House & at Ground Zero to the U.S. Special Forces that carried out the near-flawless operation to President Obama, we all deserve to celebrate this very good news.